It is the first UHP Interview with an internacional band ! Mike: at what age.. you have started to listen to Horror Punk and when you have decided to play in a band of the genre? Mike: In how many bands have you played? And what are those bands? JV: I had a few garage bands and stuff when I was young nothing with mention or that did anything, My first band I started on my own was at 16 called "Dead By Dawn" we recorded 3 or 4 songs and played a few shows. From that band I met J-sin Trioxin, and was asked to join Mister Monster at age 17. I played with Mister Monster till age 20. During Mister Monsters downtime I was approached by Michale Graves (Ex Misfits) right after his departure from his band "Graves" to join what would become "Gotham Road" During Gotham Road (2002) I also played with a band called "I Hate The Color of Your Skin" In 2005 Gotham Road went into hiatus, and more or less turned into the "Michale Graves band" which I then toured with from 2005 to 2009. 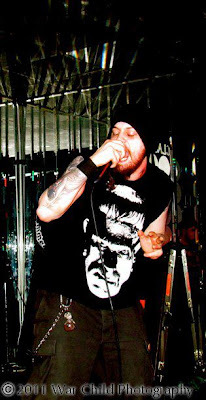 In 2009 I started 2 bands "The Doomsday Prophecy", a modern death metal band, and "Darrow Chemical Company" a punk rock band I ended up singing for. 2010 saw a Gotham Road reunion, and 2011, a Mister Monster reunion.in Early 2012 I was approached to play guitar for Blitzkid on their final American and European tours. I am currently working with "Darrow Chemical Company", "The Doomsday Prophecy", and "Mister Monster"
Mike: Any band in particular that you liked play the most? JV: I always used to say Gotham Road, now its Darrow, but I really wished I would have joined Blitzkid sooner in the game, as I feel that situation was fitting for me. 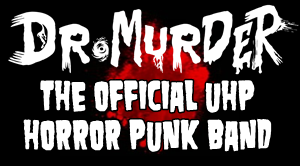 Mike: what horror punk bands do you like the most? JV: Samhain and The Groovy Ghoulies. JV: Conne Island in Leipzeig Germany with Blitzkid. The place was PACKED! Mike: Do you think the horror punk from 10 years ago it's the same of today? JV: I think everyone is just now catching up and copying what it was 10 years ago. Mike: Got any tips to beginner bands? JV: If you aren't willing to sacrifice everything at any point in time, stay in school. Mike: i've noticed that horror punk fans mostly are "attached only to the misfits, of course we all love the band (even cause they invented the genre)... but for me, the fans should support newer bands or even the old ones that ain't got the credit that they deserve.. What you think? JV: I dont think the mass majority of people know of that many horror punk bands aside from the Misfits. I think how similar a lot of the bands sound detract people from checking out too much more. A lot of it is very similar, and lacks identity of its own in my opinion. Mike: Nowadays you are playing in Darrow Chemical Company... Do you guys have any work planned to 2013? JV: Yes I intend to take the band out on yet another american tour. My current focus is working on our next release, I'd like to do a full length but I get antsy when we write a few new ones so who knows. We have a bunch of new songs that I cant wait to record and share. Mike: How was it being on Blitzkid? Is it true that the band is over? JV: I really enjoyed my time in Blitzkid its a shame I came into the fold so late, it seemed like I could have been more of an asset to the band had I been around earlier in the game. Goolsby and T.B. pretty much had agreed that if they couldn't give the band 110% anymore than it wasn't fair to the fans or the music. I hope one day everyone can once again give that effort to the band. Mike: Have you already came to Brazil with any of the bands that you played? JV: No I have not been to Brazil yet. Mike: What are your thoughts about the brazilian fans? JV: Well it seems as if there are a lot of you, and I look forward to personally shaking hands with all of them. Mike: J.V, to conclude our interview, can you leave a message to all the brazilians that are fan of your work? JV: Than you for reading Check out all of my past and present projects, Stay Tuned, and support D.I.Y. music.